Once upon a time not so long ago, in a place not so far away, a baby boy was born. His eyes were as blue as the sky and his hair had been kissed by the sun. His mother, a very wise woman, knew the dangers of selecting only one godmother from among her friends, so she asked three of them to do that honor, and from that day forward they were called the three fairy godmothers. Now, it's not very well known, but fairy godmothers are cursed with weaknesses as well as endowed with strengths. Among the three, two were blessed with culinary skills and the desire to enjoy foods of all varieties. One fairy godmother, while generous to a fault and possessed of many sterling qualities, was, well, a picky eater. And so it happened, as it sometimes does, that when the three fairy godmothers bestowed gifts upon the baby boy, in a moment of confusion the child received the gift of -- picky eating. Interestingly, the foods which the boy refuses to eat mirror the foods that his fairy godmother refuses to eat! The baby is a charming young man now. And his mother likes to tell the tale of the time a teacher tried to explain to him that fairy godmothers don't exist. The frustrated teacher took the problem to the boy's mother. Imagine the teacher's surprise when she told him that her child had three fairy godmothers! As is their want, the mother of the child and the three fairy godmothers came together to celebrate New Year's Eve. This fairy godmother, knowing that the boy's mother was fond of smoked salmon, procured it from her local fishmonger. But she didn't dare serve it in the presence of the picky eater fairy godmother. The mother of the child had to take her leave of the festivities. And then the picky eater fairy godmother traveled many miles home. Unexpectedly, the mother of the child returned, bringing her son with her! The remaining two fairy godmothers were delighted to see him! Alas, due to the picky eating gift, the salmon still could not be served in his presence. And so it was that this fairy godmother was left with a package of salmon that she would not let go to waste, and she concocted this recipe. Slice the onions quite thin. 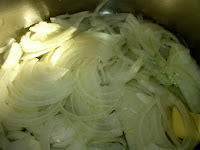 Over medium-low temperature, heat the butter with the olive oil and add the sliced onions. Cook until soft and translucent. Sprinkle with pinch of thyme and add the champagne. 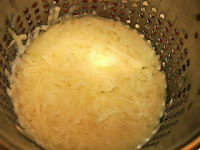 Add the chicken broth (1 cup if you want mostly onions, 2 cups if you want a bit of sauce). Simmer, stirring occasionally, until the liquid has reduced. 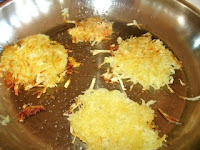 Peel and grate the raw potatoes. Press the raw potatoes in the ricer to eliminate excess liquid. Heat 1-2 tablespoons olive oil in each pan at a temperature just below medium. When hot, scoop approximately 2 tablespoons of raw potato into your palm. Press into a circle about the size of your palm and flip into the frying pan. Repeat with all the raw potatoes. The potato rounds won't be very thick, so each side should only take about 4-5 minutes to cook. They should be golden brown. Remove the cooked potatoes to a plate lined with a paper towel and dab with another paper towel to eliminate excess oil. Each stack will contain 3 potato rounds. Begin the stack by placing potato rounds on the baking pan. On top of each potato round, add a thin slice of smoked salmon. Top the salmon with approximately 1 teaspoon of grated Gruyere. Add another potato round. Top with salmon and Gruyere again. End the stack with one final potato round. Bake in oven for about 8 minutes. 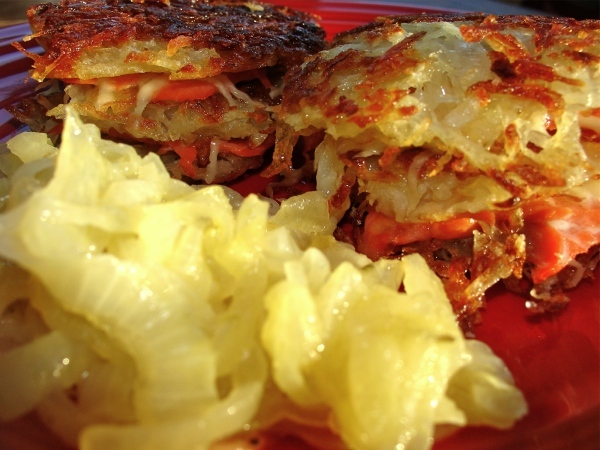 Serve with caramelized onions. Then hope that your fairy godmother comes to wash all the pots and pans. This made 4 stacks, enough for two average eaters. But we snarfed it. Next time, I might be inclined to double it. 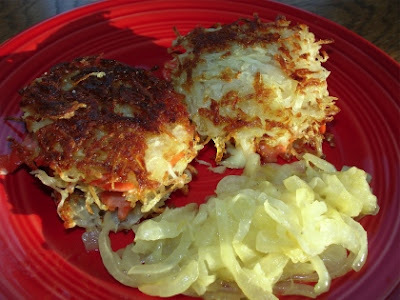 It looks delicious...but I'll skip the salmon and just take the potato cakes and onions. I guess the son and I have one of the same godmothers...and that same gift! What a lovely story! I wish I could remember when I first tasted smoked salmon--I must have been in my 20s--but I was hooked from that moment. Am I really supposed to find 3 Tblsp of champagne? I suppose I'd have to finish off the rest of the bottle--I'd hate to see it go to waste. Oh no, Katreader! That pesky fairy godmother has been busy. Maybe you could use a thin piece of ham instead? Thanks, Sheila! It does seem like smoked salmon eaters fall into firm categories -- either you love it or you really don't like it at all. LOL about the champagne. I had some left over. I'm sure you would find an, ahem, use for the rest of the champagne! Oh, yum, don't these look great. Sort of crab cakes with a major twist. Got to try! My husband will adore them, too. Not a picky eater. Love the fairy godmother tale. So sweet. Avery, I hope you and your husband enjoy them. We thought they were great! I'm glad you like the title! Wow, sour cream and capers would be fabulous, Lucy! Great idea. You're so cute, Cleo. 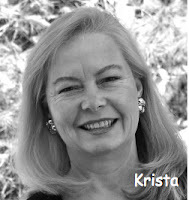 Yes, the young man has a lovely sense of humor -- he needs to with three wacky fairy godmothers! I can just see you and Marc enjoying this dish for brunch. A glass of champagne would go with it perfectly! Love the fairy tale story. But I recently tried to make a simlar recipe--never could get the potatoees crisp, substituted sour cream for creme fraiche (a mistake) and considered the dish generally a failure. Luckily the guest I expected didn't show up. I'll try this one next time. I think lately I've been overdoing on capers and anchovies, so I might omit the suggested capers though normally I love them. I don't know why you think some fairy godmothers don't eat salmon. I don't think all fairy godmothers hate salmon!